We’re immensely proud of Chloe, our studio and production administrator who won a Print Futures Award last month with The Printing Charity. A studio and production administrator at an award-winning Yorkshire-based print management firm has won a national industry award. Chloe Johnson, who celebrates her fifth anniversary at Birstall-based PMG Print Management in August, has been awarded a training grant of more than £1400 in this year’s Print Futures Awards. The Print Futures Awards are run by The Printing Charity, the UK’s second oldest occupational charity with near 200-year history. The awards have been helping to attract and retain new talent in printing, publishing, packaging and graphic arts since 2003. The awards offer grants to people in the industry aged 18-30, to pay for training courses to help with skills development and career progression. Following a successful application, Chloe was invited to attend an interview in London where she impressed the judges talking about her role at PMG and aspirations for her career, as well as explaining how the training grant would help her progress. Chloe was awarded a grant of more than £1400. Chloe has been invited to attend a celebratory event at the House of Lords in July, alongside the other winning applicants. 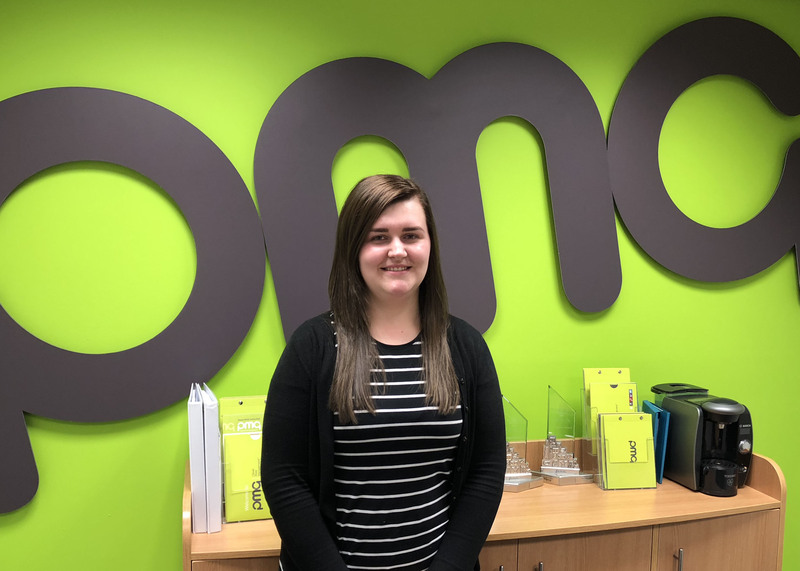 Chloe, who lives in Dewsbury, joined PMG Print Management in 2013 as an apprentice, completing level two and three in business administration. In 2015, she progressed to a permanent position in the Design Studio as a studio and production administrator. PMG, provides ‘clever print management’ services, offering cost effective solutions to every type of print campaign. The company’s emphasis on quality and efficiency won the firm the IPIA’s ‘Print Management Company of the Year’ three years consecutively. “I am thrilled to have been awarded this grant to help me further my career in the print industry. Having worked at PMG for almost five years, I am delighted to be given the opportunity to complete training which will provide me with the skills to progress. “The whole team is very proud of Chloe, we’re so pleased that she’s been awarded this prestigious grant. Chloe is a great asset to our team and we can’t wait to continue seeing her thrive in her career here at PMG.